Click HERE to download GIS Shape Files. *Note these files require a GIS application. We are not available to teach users how to use GIS software. Click HERE to download the most current Google Earth .kmz file. *Note this file requires the free Google Earth Pro on Desktop program be installed on your computer. Download Google Earth from this website link. Install the file – it takes some time to download and install, so please be patient. That will launch Google Earth (assuming you have it installed on your computer). Click on a parcel to open a balloon with partial information about the parcel. Click on the blue, HERE button inside the balloon to go to our website and get all the information about the parcel. 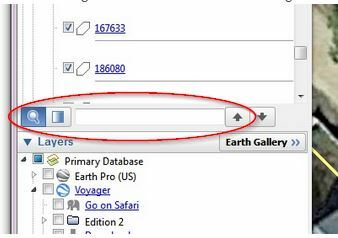 Find the Google Earth Places Search to the right of the magnifying glass icon below. Type the PID into the space provided. Google Earth should scroll through the parcels and highlight the one you typed in the area above the search window. Double click on the highlighted parcel. Google Earth will zoom to the parcel and open a balloon with summary information about the owner. For more information about the parcel, click on the blue HERE link inside the balloon and Google Earth will open our website with all the information about taxes, ownership, values, etc.